Manufactured to OEM specifications. Meets SAE J198 Standards. 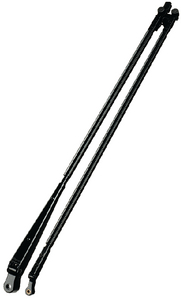 Fits ISO-Double Flat Pivot Shafts, common on class A RV. Made from carbon steel. For use with saddle mount wiper blades. 50MM Spacer between pantograph arms.